Are you able to see footage from the movie before composing the music for the video games? In most cases, the movie footage isn’t available when I’m working on music for the game. However, with SPEED RACER: THE VIDEOGAME, I was able to actually see a video sequence from the creators of the film, the Wachowski brothers. The video was a conceptual previsualization, or a ‘previz’ – a rough cut using simple computer-generated graphics – and the game developers sent the video to me as soon as I was hired. The Wachowski brothers made the video as a presentation to the movie studio, to show the movie executives what their plans were for the picture. If you’ve seen the Speed Racer movie, you know that it is chock full of these enormous, epic races. The conceptual previz showed one of these races, and it was amazing to watch. Joel Silver, the producer of the movie, was interviewed recently and he said that some shots from that early rough-cut previz video were actually used in the final film, in a much more refined form. When I went to see the movie a few days ago, I kept an eye out for those shots from the previz, and when I saw them it was very exciting! The conceptual previz was an amazing video. For my work on the game, I stripped the audio from it so that I could play it while I was composing music. I must have watched that video hundreds and hundreds of times for inspiration while I was working. How long did it take you to develop the music for SPEED RACER: THE VIDEOGAME? I worked on the music from October 2007 to January 2008. Creating the music for SPEED RACER: THE VIDEOGAME involved some very complex and intricate work. The music incorporates a fusion of many disparate musical genres, ranging from grunge to ragtime, with heavy doses of metal, funk, orchestral and electronica sprinkled liberally throughout. I wrote over 75 minutes of music for the game, and the entire experience was very intense. 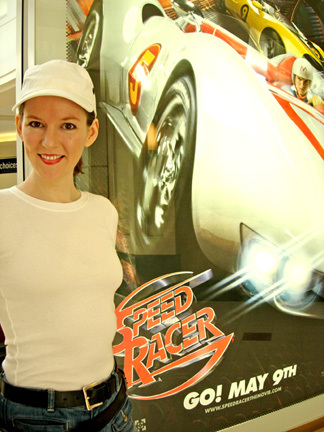 For all my projects I work with award-winning music producer Winnie Waldron, and during music production on SPEED RACER: THE VIDEOGAME she was invaluable in keeping the work on schedule and the quality of the music up to the highest standards. The game was developed by Sidhe Interactive, which is a game studio based in New Zealand. The game’s producer Andy Satterthwaite kept in close contact with me via e-mail, offering feedback and advice constantly. Andy has a distinguished track record in the videogame field, particularly when it comes to racing games such as SPEED RACER: THE VIDEOGAME. His resume includes Wipeout64, Quantum Redshift, and Gripshift. I was grateful for the terrific support system I had while I was creating the music for this game. How do the kids in your circle of family and friends feel about you composing the music to some of the popular video games such as Speed Racer and Shrek the Third? Speed Racer and Shrek the Third are great family-friendly movies, with tremendous kid appeal – not to mention the Charlie and the Chocolate Factory game, which was also a project that I worked on a few years back. Though I’ve also created music for some very adult fare, including The Da Vinci Code videogame and the mature-rated God of War, I enjoy taking a break from the serious work every so often and focusing on a game that can be enjoyed by the entire family. And yes, working on projects like that can make a person very popular with the younger set! Was it hard to get your foot in the door in what is normally a male oriented industry? It’s hard for anyone to get their foot in the door in this industry, regardless of gender. Thankfully, there are resources to help minorities and any group facing special challenges. The Independent Game Developers Association has a special interest group called “Women in Game Development”, which focuses on the issues addressing women in the game industry. It’s a great resource and support for female game developers. What advice would you give others interested in pursuing a career in the video game industry, regardless of what role they want to play? Anyone who wants to enter this industry needs to hone their craft. Competition for jobs is pretty fierce. Unless you’re a programmer, in which case you’ll have a much easier time finding work. Otherwise, breaking into the game industry can be a rough road. I’ve heard some people advising industry newcomers to get involved in amateur projects being coordinated across the internet, such as small independent games with no budget, or fan-made modifications of existing games. These kind of projects can give you some experience, as well as a credit to put on your resume, which certainly couldn’t hurt. Also, I’ve heard that having a specialized degree can help, particularly if you’re interested in pursuing a career as a game designer. There are some universities that specialize in preparing students for the video game industry, including Full Sail University in Florida, the Digipen Institute of Technology in Washington and Guildhall at SMU in Texas. I’ve also come across some success stories in which people have started working as testers at game studios and have subsequently been hired into the development teams – but these anecdotal instances are quite rare. With all that being said, if you specifically want to get into the game music field, then the strategies I’ve just described will have little bearing on your goal. 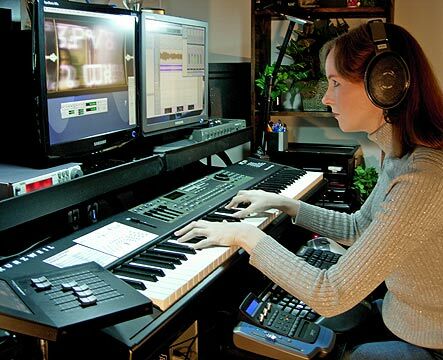 All that really matters in the field of game music composition is the quality of your music, the technical sophistication of your music production studio, and the tenacity with which you pursue your dream. My music producer Winnie Waldron and I just finished work on a game project that we’re very excited about. It was a lot of fun to work on, and it’ll be coming out later this summer. Beyond that, I can’t say anything just yet about it. Also, we recently started work on another game that’s quite epic in scope, and very exciting! Again, I’m not allowed to say anything else. Be sure to pick up your copy of Speed Racer - The Video game now and watch the movie in theaters now! To learn more about Winifred Phillips, be sure to visit her website: http://www.winifredphillips.com/. Interview by Shelia M Goss, an entertainment writer and author of Double Platinum, My Invisible Husband, Roses are thorns, Violets are true and Paige's Web. For more information, visit www.sheliagoss.com. Content copyright © 2018 by Shelia M. Goss. All rights reserved. This content was written by Shelia M. Goss. If you wish to use this content in any manner, you need written permission. Contact BellaOnline Administration for details.